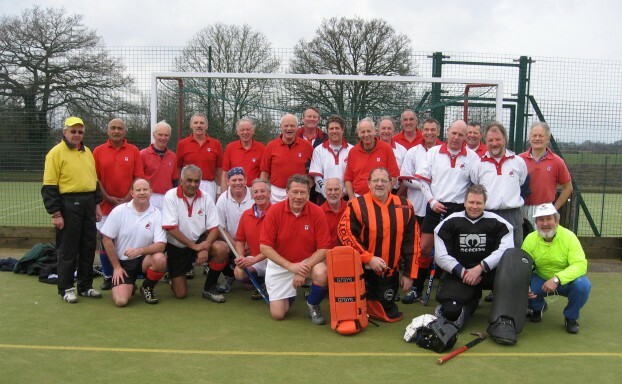 This LX Club traditional fixture held at the Lord Wandsworth College at Odiham, North Hampshire, epitomised everything that the LX Club England enjoys in its fixtures. Despite a pessimistic heavy rainfall prediction, all thirteen players invited to play turned up, starting with an inspirational pre-match briefing by Captain Richard Clarke, who decided to implement a flexible 4-2-4 formation, based on the player skills available to oppose the always formidable Warlocks. It was excellent to see three newer members, Peter Danson, Brian Stokes and Neil Stone in the LX Club team. The first half began with the LX Club being dominant, and goal-bound shots from Bob Grenside and Peter Danson went near to securing an early lead. However, against the run of play, Warlocks’ centre-forward, Iain Baxemdine, scored a goal from a penalty corner, with an unfortunate defensive deflection leaving Barry Sewell stranded in the goal. However, LX Club continued the overall pressure with John Longden and Adrian Money strong in defence. The continual skilful midfield performance led to Brian Stokes passing to Sudesh Nayar, who equalised the score to 1-1 at half time. The second half was dominated by Warlocks with the youthful skills of John Smith and Richard Slator, who together with the Warlocks centre back, Gavin Stone, gave the LX Club little opportunity to get near the opposition’s goal. Mike Sprange, one of LX’s squad, who was loaned to Warlocks, and played on the left wing, hit the LX goalpost, plus nearly scoring with another good shot. Colin Pinks, who performed superbly, saved a goal in the cause of necessity to avoid facial injury, getting his stick upwards after a penalty corner, to deflect the ball over the top of the LX goal. The Warlocks pressure continued, and eventually the unmarked Stewart Neville-Rutherford on the right wing struck a tremendous shot past Barry Sewell, with the LX defence expecting a pass to the top of the circle. Richard Clarke then delivered a pass to the sprightly Keith Hunt on the right wing, who won the first of four penalty corners. For the last penalty corner LX crowded around the circle, and following numerous shots at goal, Neil Stone steered the ball into the Warlocks goal to level the final score at 2-2. No LX Club fixture can be arranged without considerable contribution from several sources, and acknowledgement is given to the two Umpires, Tom Darlington (LX Club) and John Polley (Warlocks), who controlled the game well. Many thanks go to Barry Sewell (LX Club and Warlocks member) who took on the job of successfully organising this fixture. Thanks also go to the Warlocks Club, who are always highly competitive on the pitch, and for their hospitality in the Poacher’s Inn, and to the supporters of both teams who came along. LX Club squad: Richard Clarke (Captain), Barry Sewell (GK), John Longden, Colin Pinks, Adrian Money, David Read, Brian Stokes, Keith Hunt, Peter Danson, Sudesh Nayar, Neil Stone, Bob Grenside, Mike Sprange.